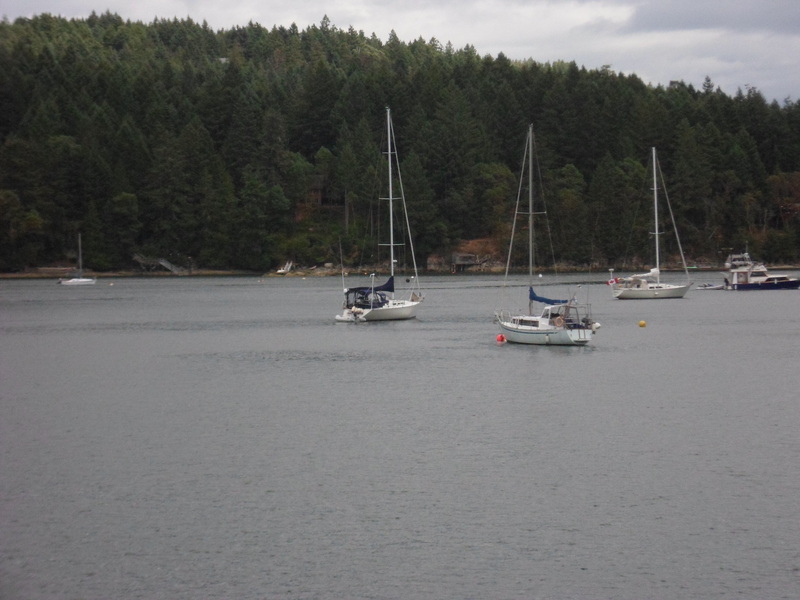 A dull morning start gradually shifted to Pender sun later in the sailing day. Our FJ crews focused on the all-important man overboard routine as fluky winds bedeviled their attempts to provide succour. 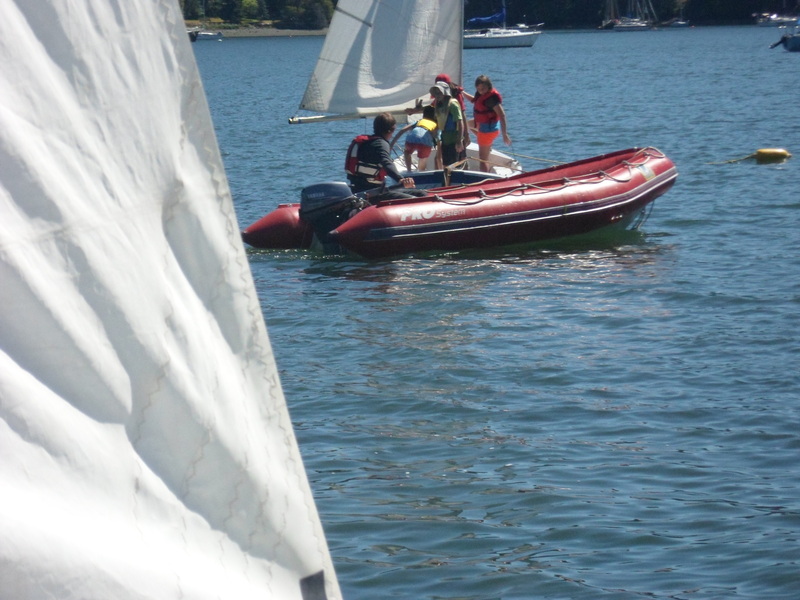 Asides from the obvious life-saving aspects, this process emphasizes boat control under duress – as many of our participants quickly found it. 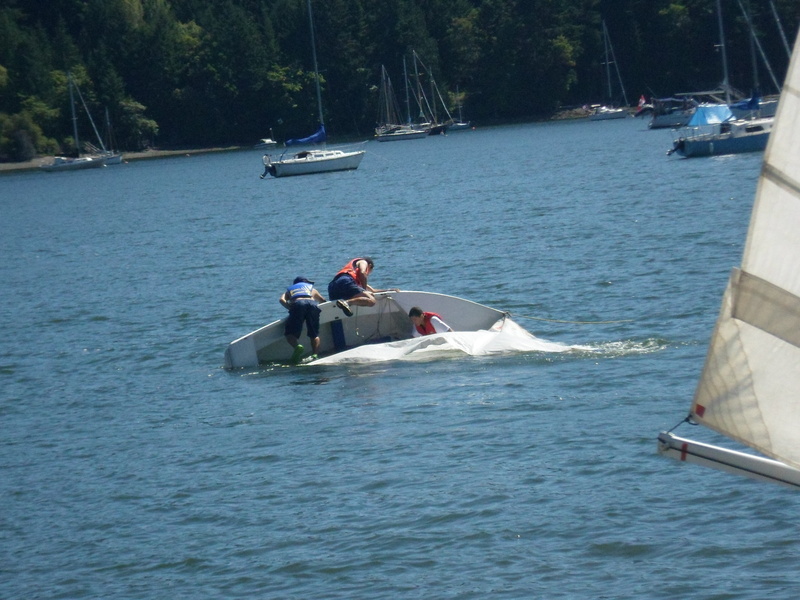 Based on a point of maximum inconvenience, crews drop a life preserver at the sound of the instructor’s whistle. Fortunately we did not insert a large watermelon into each preserver – but we always reserve the right to do so at a future point! (A slippery heavy melon certainly adds a touch of realisme). By noon bright sunshine returned, providing an opportunity to capture our Laser fleet beached and awaiting their Captains. This shot included our crash boat in action as well a Flying Junior in the background. 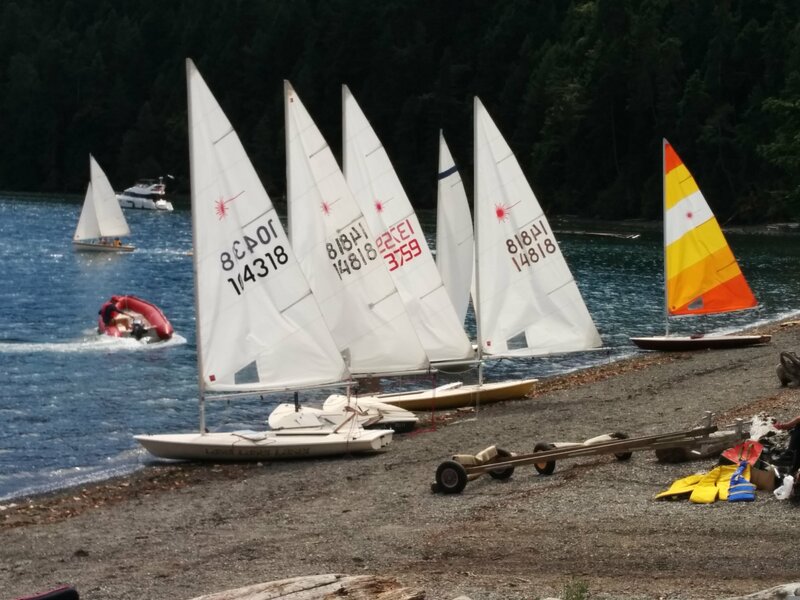 The afternoon concluded with Lasers practicing racing maneuvers and our FJ’s continuing with the overboard drills. 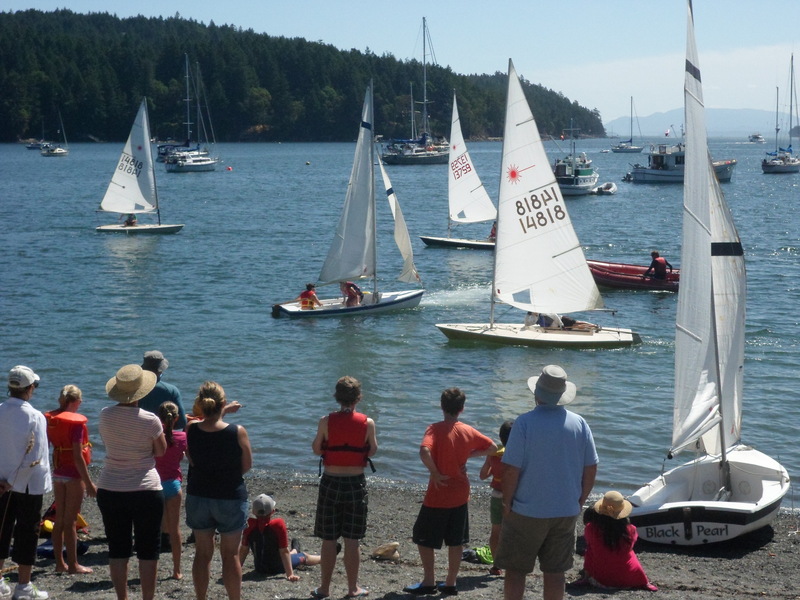 Friday will be the picnic run to the far end of Browning Harbour and our Lasers will be putting their racing expertise to use, including the dry-roll demonstrated in the final beach run at the end of the day. This entry was posted in Week of August 3rd to 7th on August 6, 2015 by johnonpender. Wednesday brought somber clouds with occasional rain showers. A welcome respite for islanders who are suffering from an El Nino-induced drought. 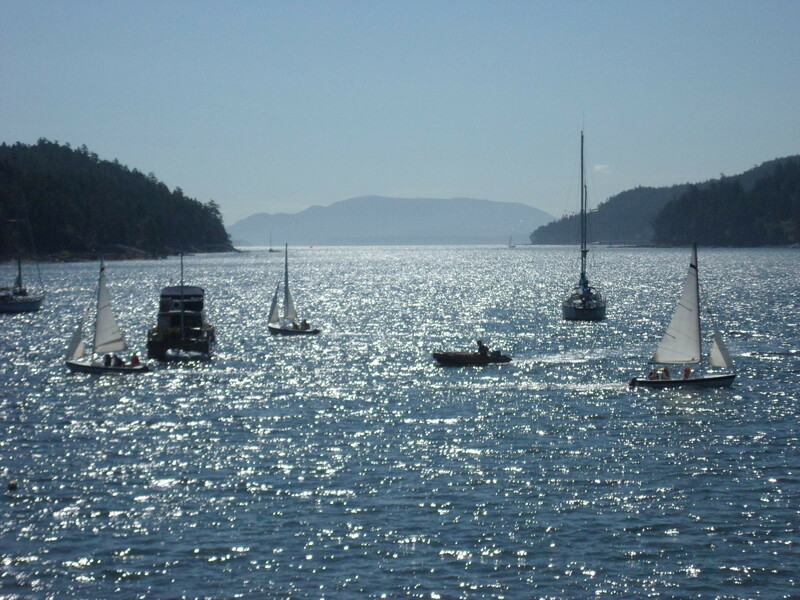 It was not quite as fulsomely welcomed by our sailors who faced cool waters with variable winds. 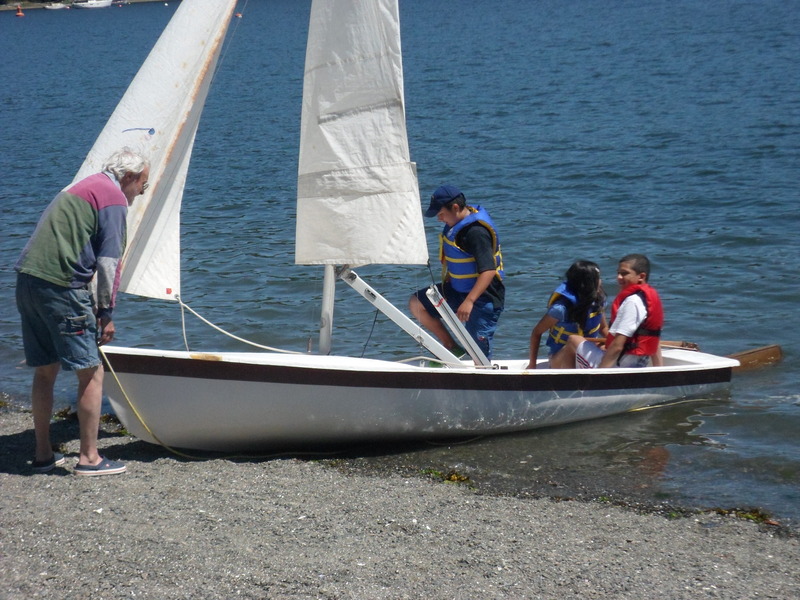 The upshot of the day was a minor collision with a moored ocean-voyager at the culmination of our classes. Our instructor spoke with the owners and relayed a damage report to us. Our Commodore and I motored out with apprehension. We have all read of blue sea voyagers when perusing our copies of Cruising World or World Navigator. Today was my first “in the flesh” encounter with sailors who have crossed the seas and returned to help us coast huggers move beyond the small stuff. What could have been an exchange of insurance documents (yes, we are covered) quickly transitioned to their desire to support our neophyte sailors and the joys and learning experiences of voyaging. 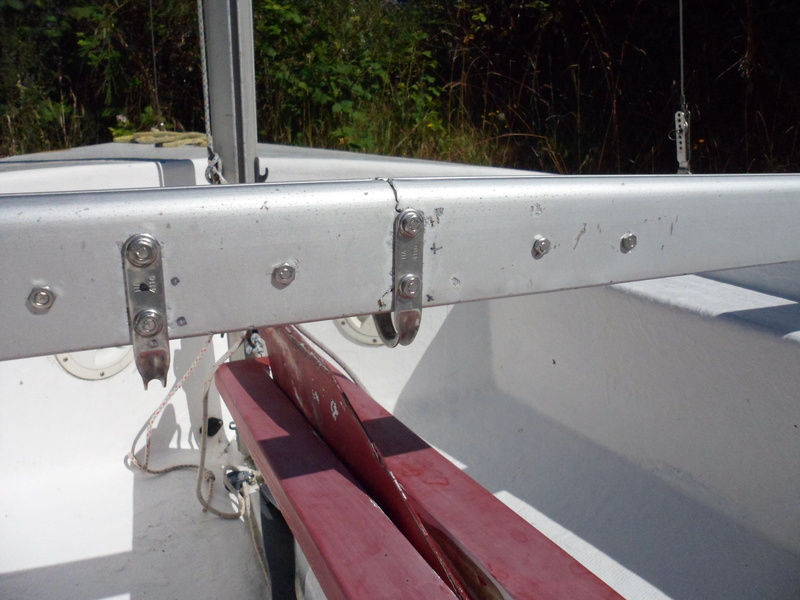 Where others would focus on vessel defacement, owners John and Loren considered gelcoat scrapes as life marks (even though their boat is absolutely beautiful). 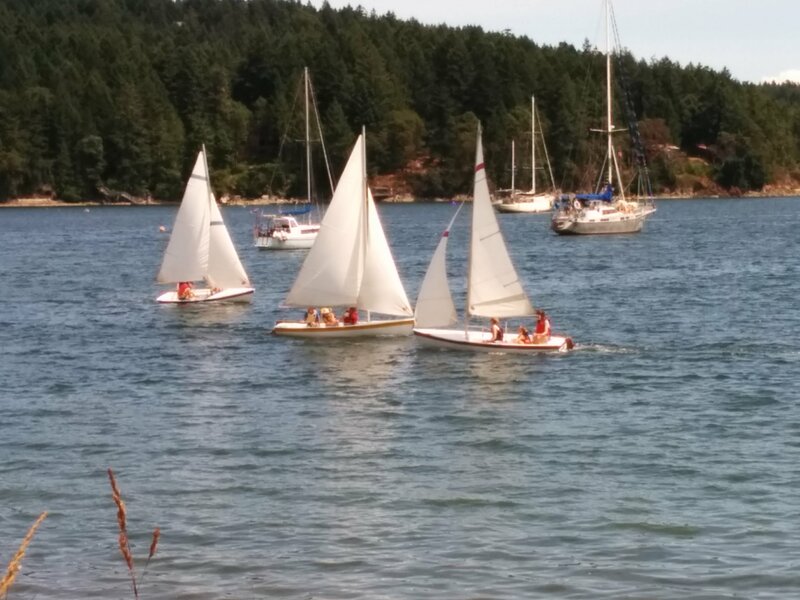 I was frankly entranced by both, later reflecting that sailing offers that rare chance to meet the best of folks who brush aside minor issues to focus on the truly important. Needless to say, the Commodore and I could have hung onto their toe rail for hours! We reluctantly returned to shore knowing this encounter will remain with us for years to come. Thank you John and Loren for sharing your perspective on life and living. (The vessel is adorned with the dark blue canopy). The day dawned bright and clear – affording ideal conditions for our students to once again be introduced to Pender waters (literally). 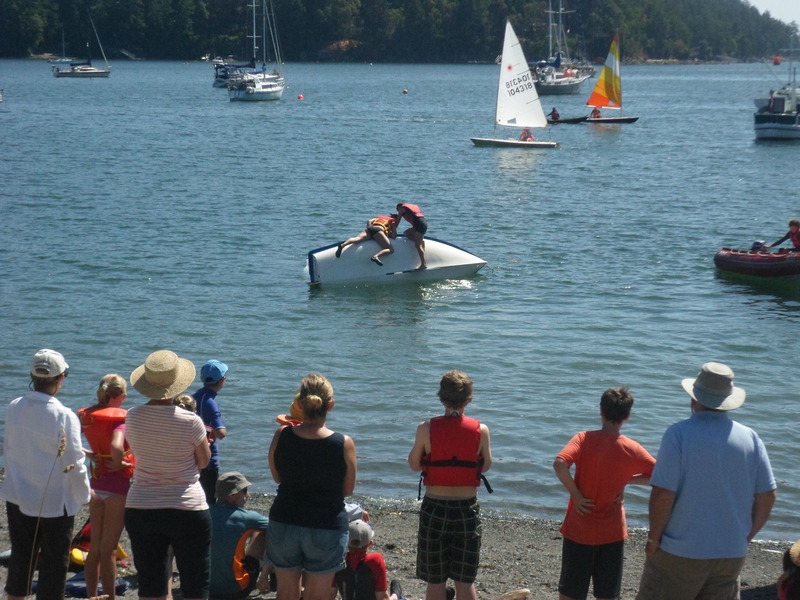 Capsize day is intended to provide sailors with the confidence to right their boats by themselves. 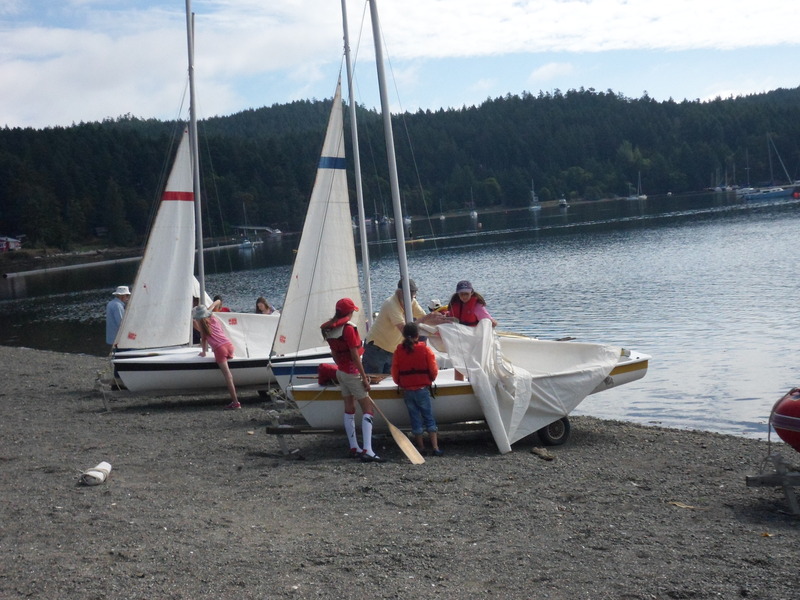 We tether a boat to a buoy and have teams capsize and right their Flying Junior boats. 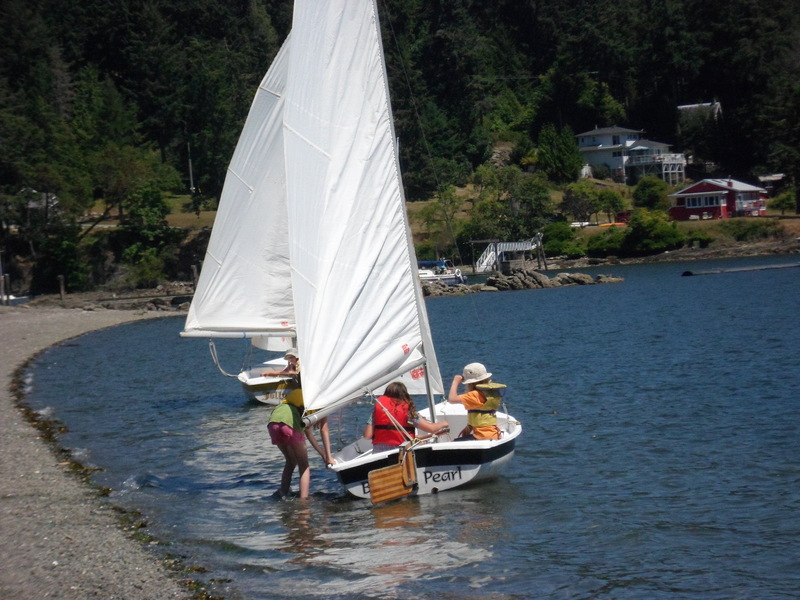 A popular sight for our shore audience which seems to be equally enjoyed by participants. 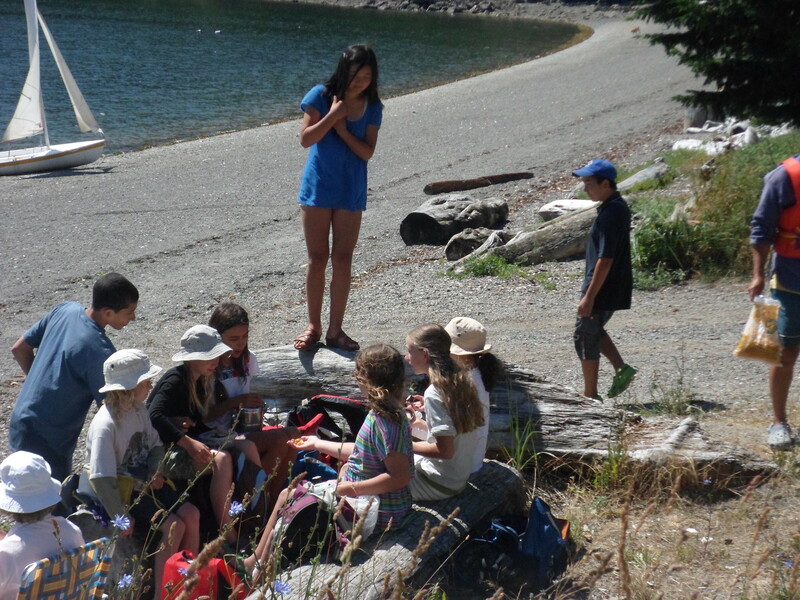 We always seem to have students asking “can we do that again?” – and , of course, we are more than happy to oblige. This year’s team included two visiting teachers from the north. With skill and alacrity they showed us all how it is done! In a fitting compliment, our experienced sailors then offered a Laser Fly-Past to ensure a picture-perfect memory. People are what makes the difference in any endeavour. Today we hosted two generational extremes. Our Honorary Board Member is a former Commodore with a stellar resume stretching from fighter jets and commercial planes to water craft. 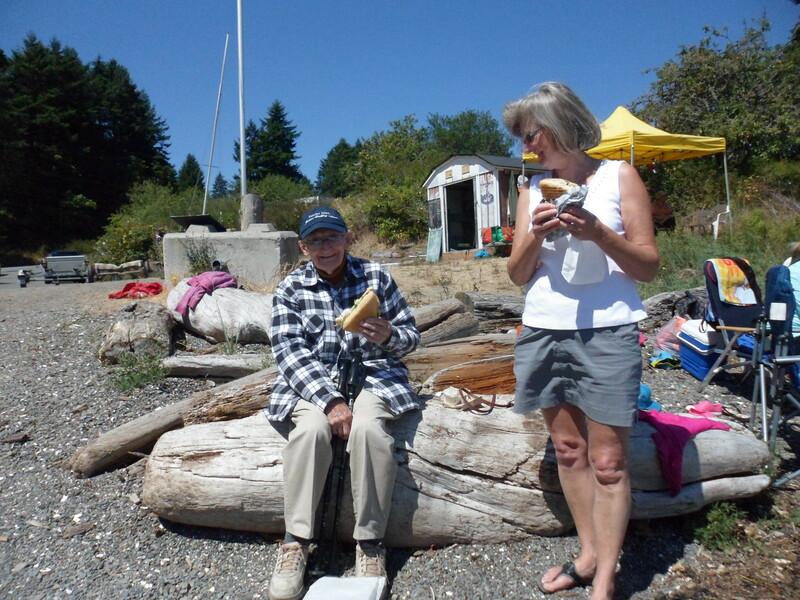 Peter is a young 93 – with a mind sharper than any boat can tack – who self-propels with a pair of walking sticks for balance. Accompanied on this occasion by daughter Joanne visiting from Montreal, he regularly visits and regales us with stories in the air. 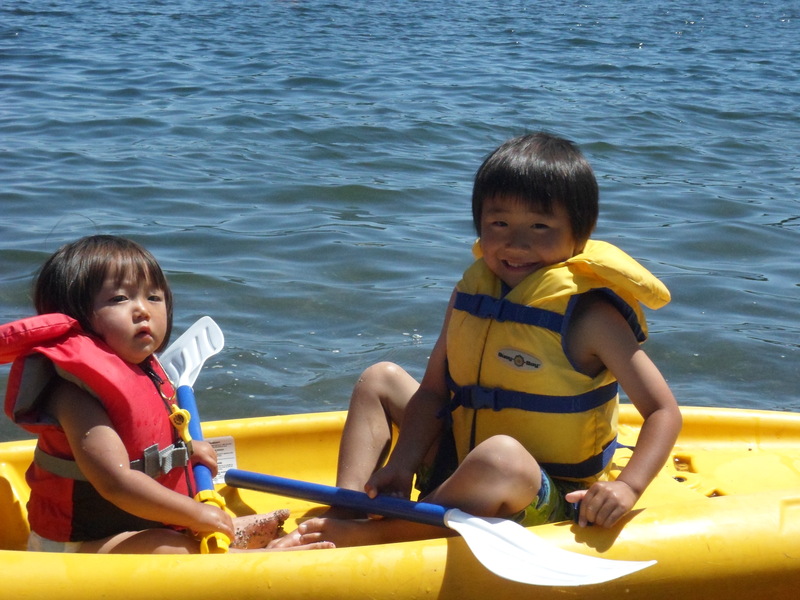 His presence contrasts with an equally loved Pender family originally hailing from Japan. 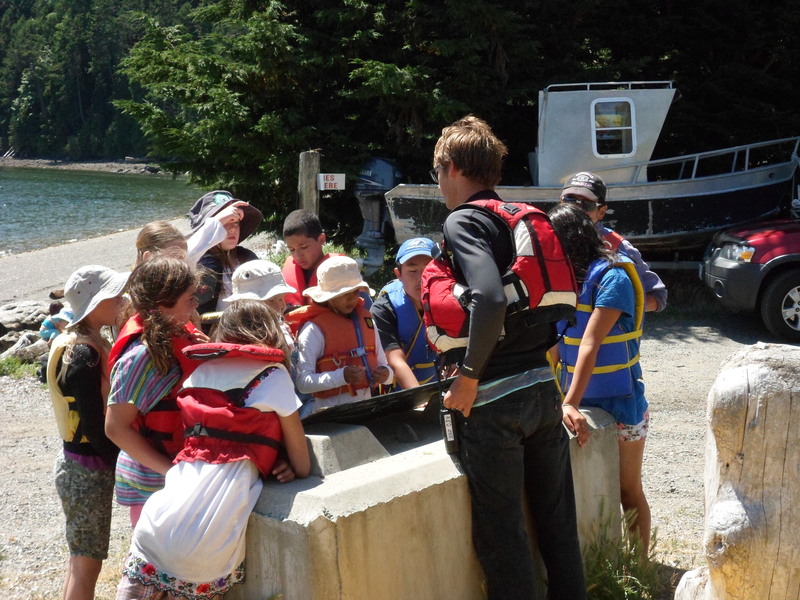 Our newest future recruit is ensconced in the safety of her ever-buoyant mother’s envelope while Dr. Don introduces other youngsters to the water. We salute all past and future sailors and remain enriched by their daily presence. Morning activities commenced with a new twist: an obligatory swim wearing safety vests. 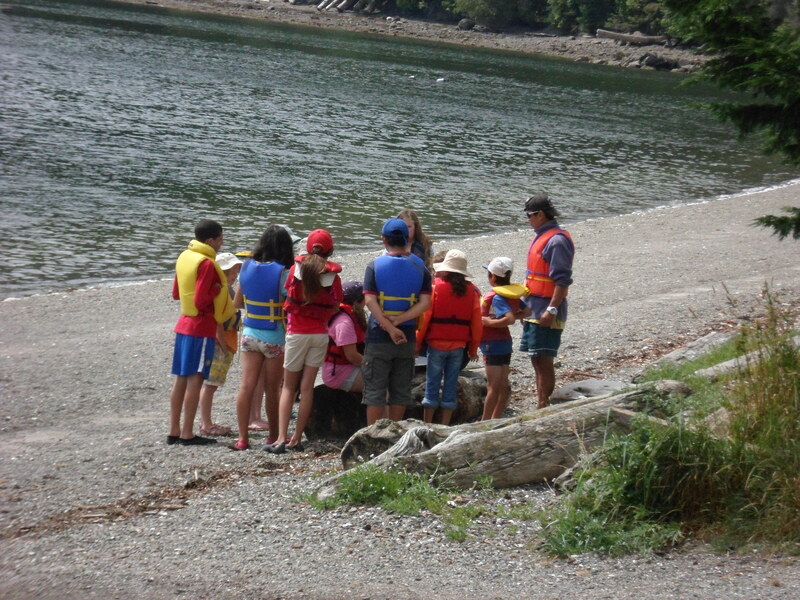 This is a new process which everyone needs to complete in order to famiiarize themselves with the effects of a safety vest as well as demonstrate their swimming capabilities. 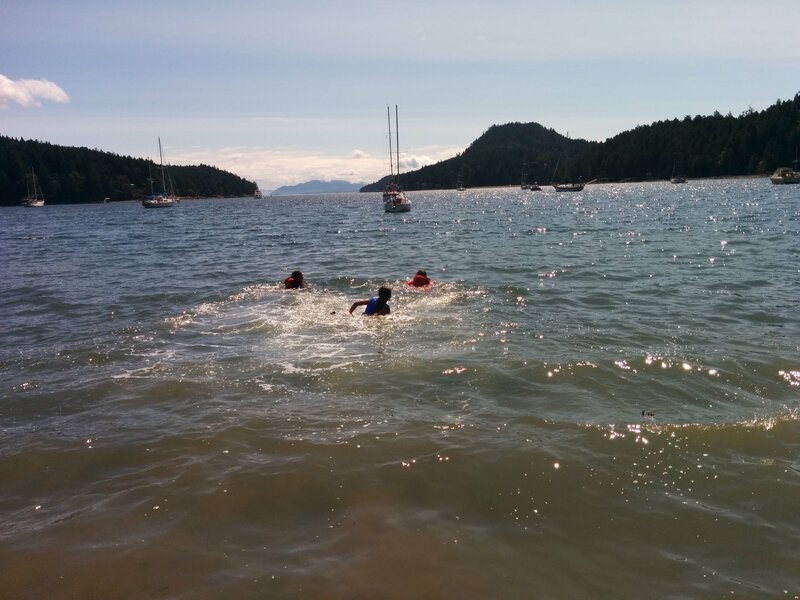 Our recruits were stellar troopers braving the cool July waters as the first of our swim testers. 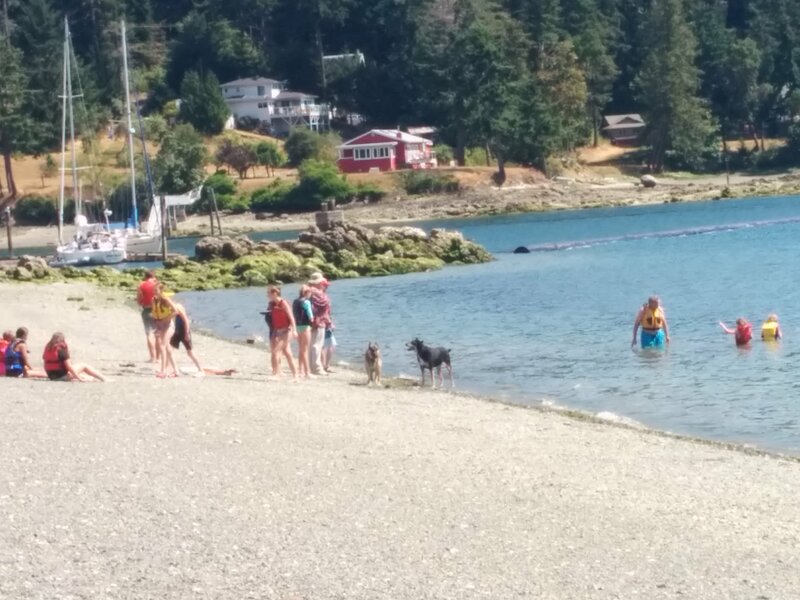 They passed with flying colours as all circled our bouy off the beach (2nd picture). 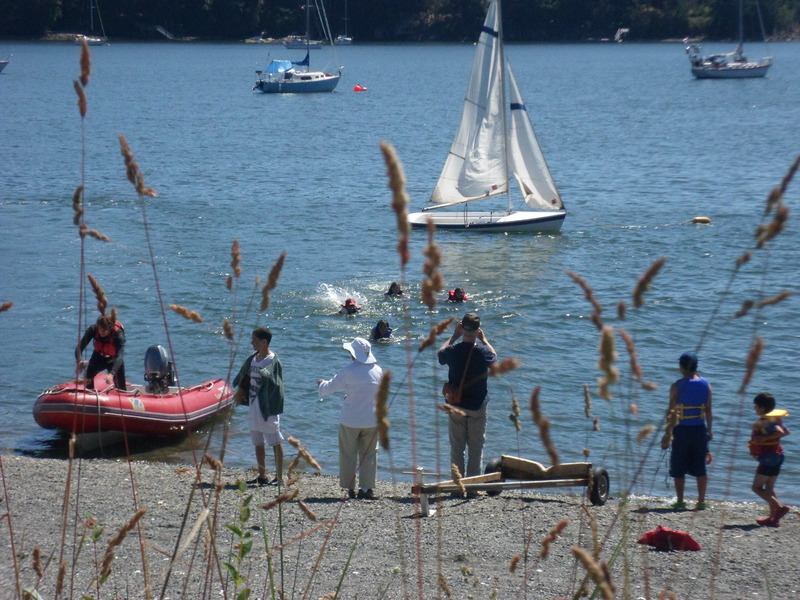 Then 3 of our resident experts opted for a gruelling swim out to a sailboat. 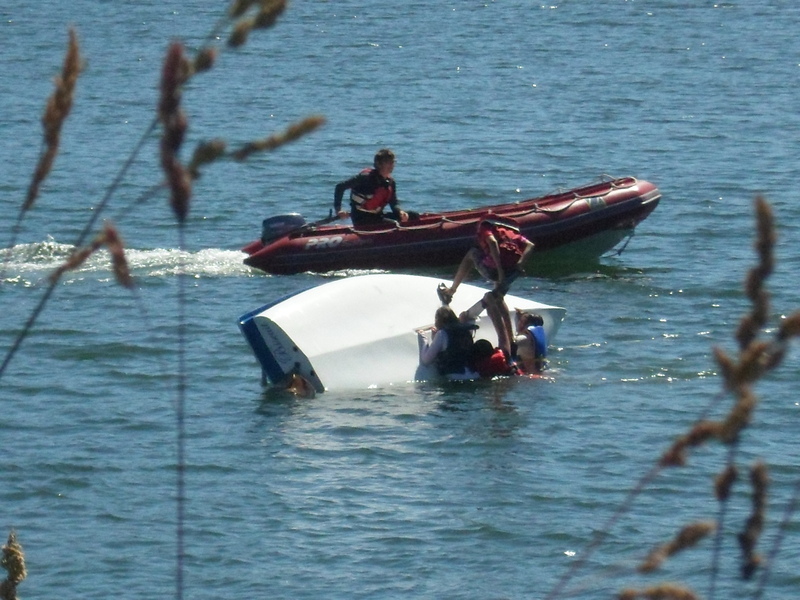 As a precautionary measure they were accompanied by our recovery craft (not in the picture). Our Orca Candidates duly returned without any intervention. Awesome congrats to all of you! This week’s team were supported by a strong contingent of prior participants which demonstrated their skills and leadership during the morning instruction by Nathan as well as the afternoon sail. 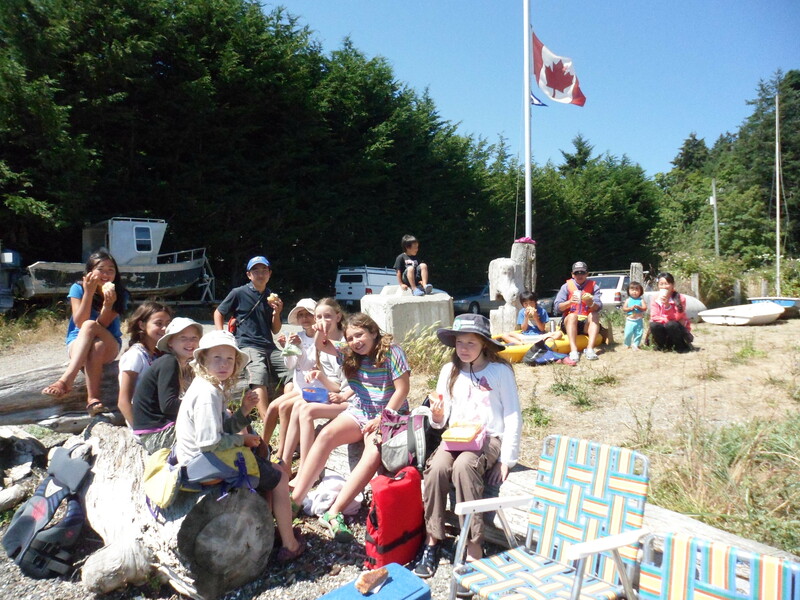 Our Board members agreed that we have never experienced a smoother departure from the beach. 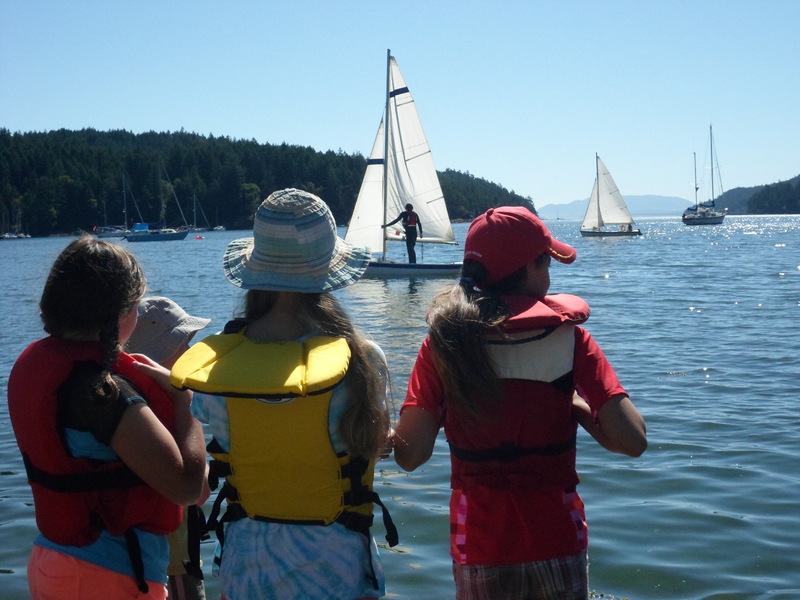 All of our skippers/crew launched their boats smoothly, admirably controlling their rudders and centreboards. 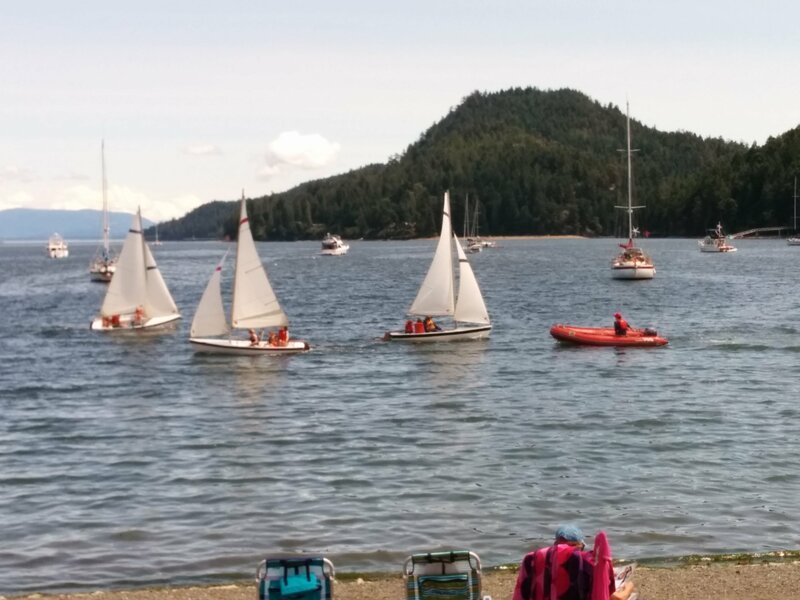 Then they proceeded to sail in formation in front of an appreciative audience in 10-15km winds. WELL DONE for a first day. Our instructor – Nathan Troost – maintained a close watch on the proceedings. Nathan is a popular returning teacher who combines a great attitude and easy approach to instill confidence in all newcomers. 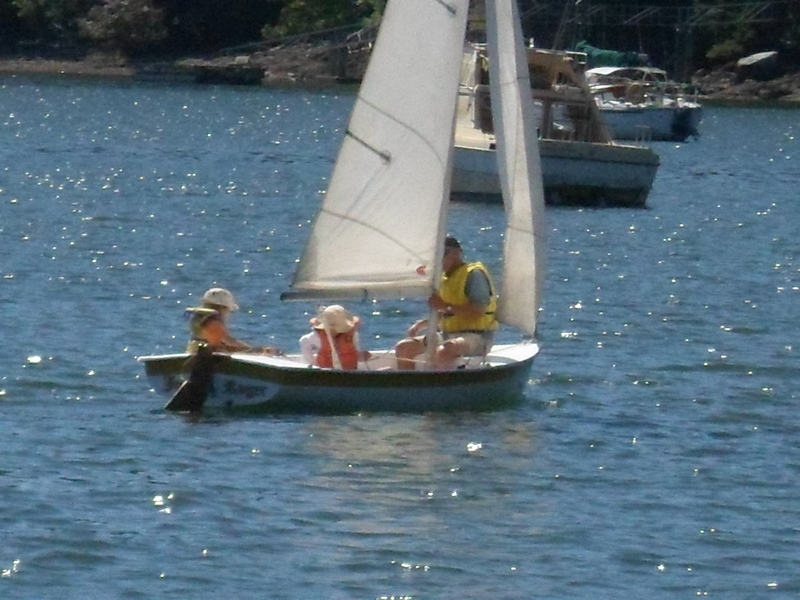 He commands our red motorized dinghy while on the water and is connected with shore support using VHF radio. 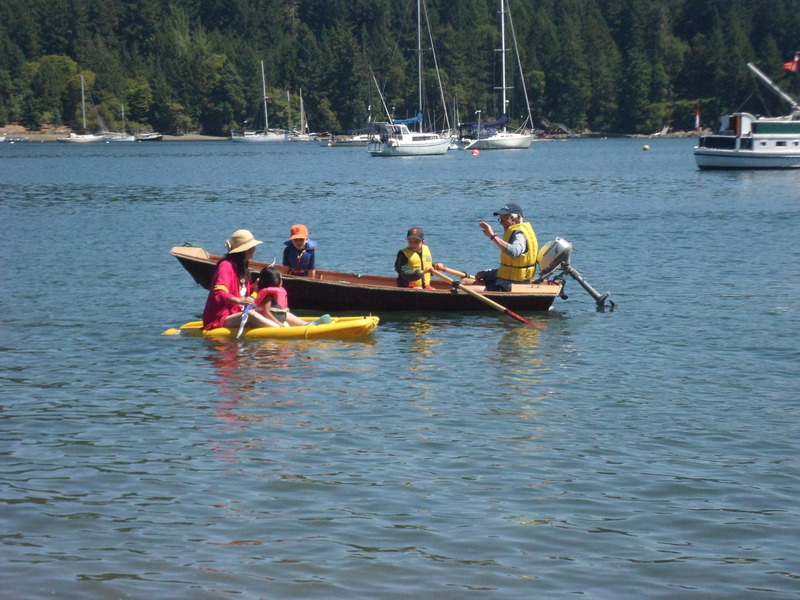 We are delighted to have him back leading our people on the water. Nathan’s skills coupled with our strong first day on-water performance combined for a first day of bliss for Board Members and sailors alike. We wish 1st days were always like this! This entry was posted in July 2015 on July 13, 2015 by johnonpender. Yesterday’s Boom mishap was soon rectified with the help of Director Bob who fixed our battered spar and returned it to the clubhouse the same evening. It sure felt stronger than new and made it through a strong wind day without a hitch. It was a sunny and blustery morning with a reported 40 knots in Johnson Strait not very far away. 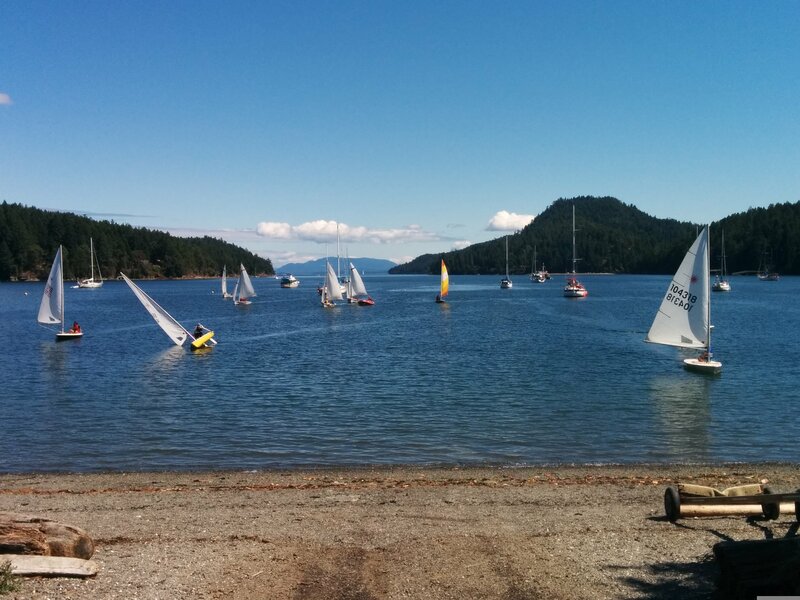 Fortunately Browning Harbour is protected on 3 sides, providing an ideal location for young sailors. We were probably running closer to a steady 10 knots close to shore and 15 further out in our anchorage, making for a lively yet controlled introduction for our students. 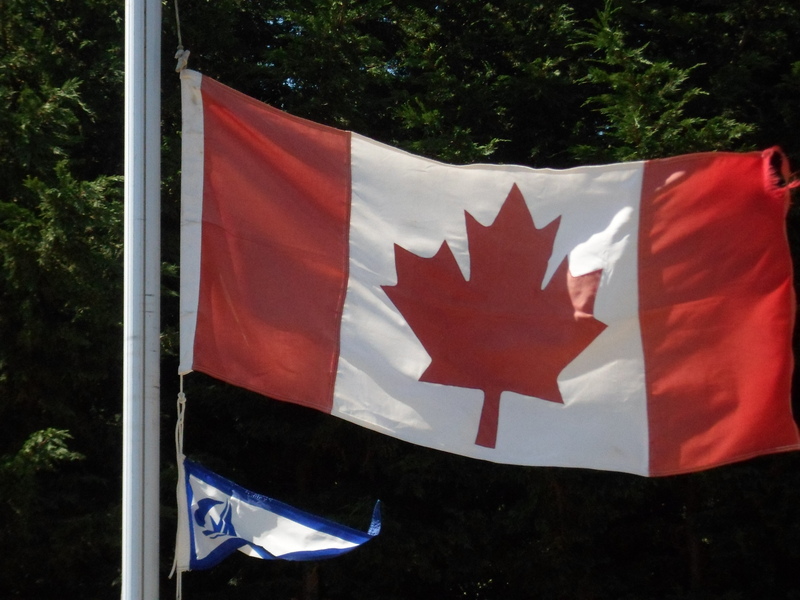 Our flag flew proudly and despite the higher than normal breeze, all boats were fully crewed on the water. It turned out to be a supreme water day for everyone as winds tapered in the afternoon, yet stayed steady throughout the day. 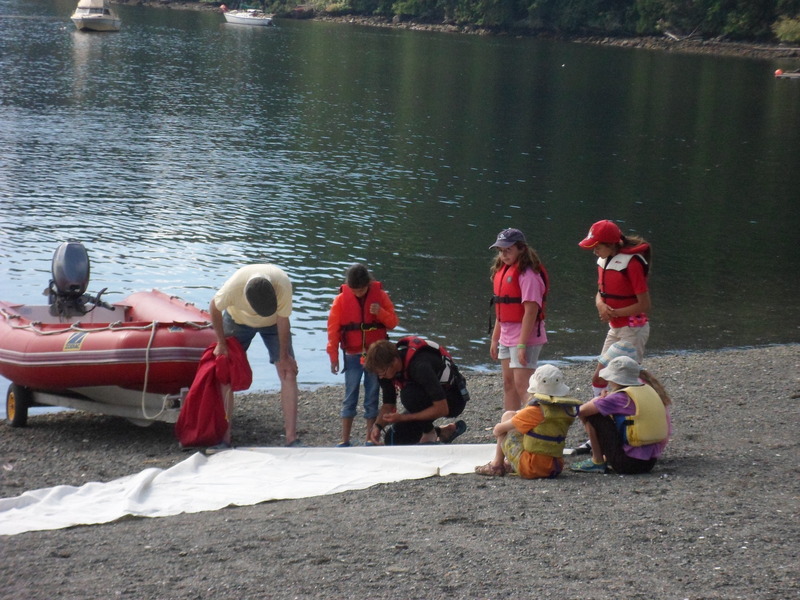 Judging by the squeals of delight we knew they were have a great time – managing their boats in lively circumstances. We never did get to see a boat dawdling as they all seemed to be stuck with a foot on the accelerator. 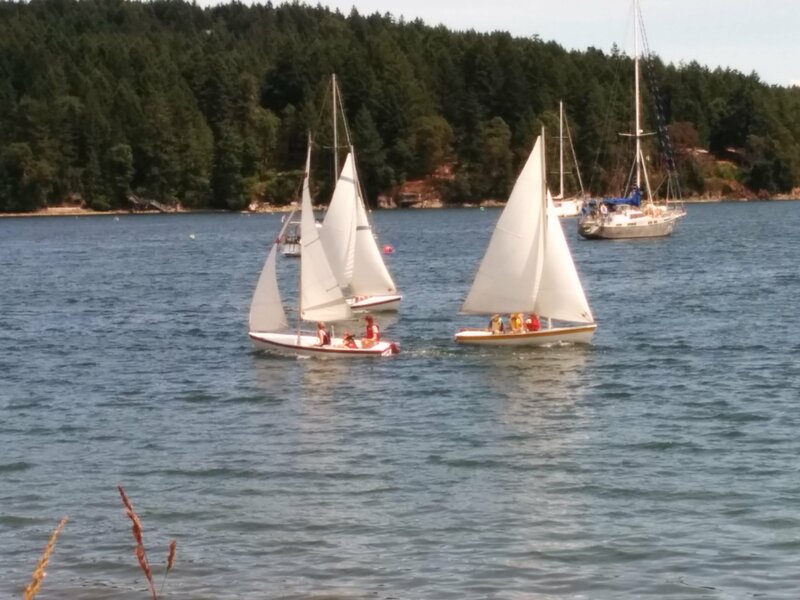 The old adage that a sailboat spotting another sailor automatically transforms into race mode sure was true of our participants today! Despite the boisterous water antics, lunch together followed by the finer points of instruction from Nathan provided the backdrop for the afternoon session back on the water. We suspect our students will sleep well tonight! This entry was posted in Uncategorized on July 9, 2014 by johnonpender. Monday dawned overcast as 8 veterans and 4 newcomers convened in Browning Harbour. The weather Gods soon cooperted as it was clear that our sailors were determined to get out on the water that very morning. 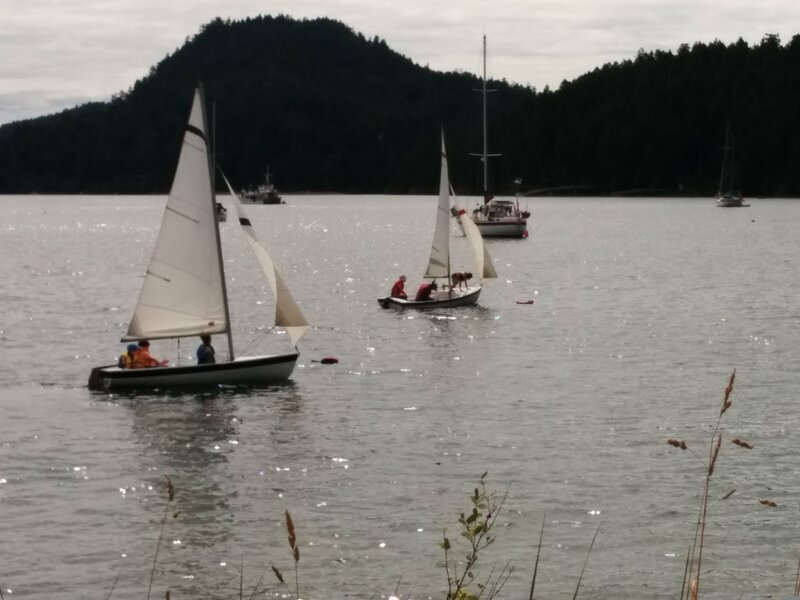 By 11:00 the group was on the water and doing a great job sailing in the bay. That continued throughout the day with a short break for lunch and the weather steadily improving. By the afternoon it was clear skies, mild winds and warm temps. 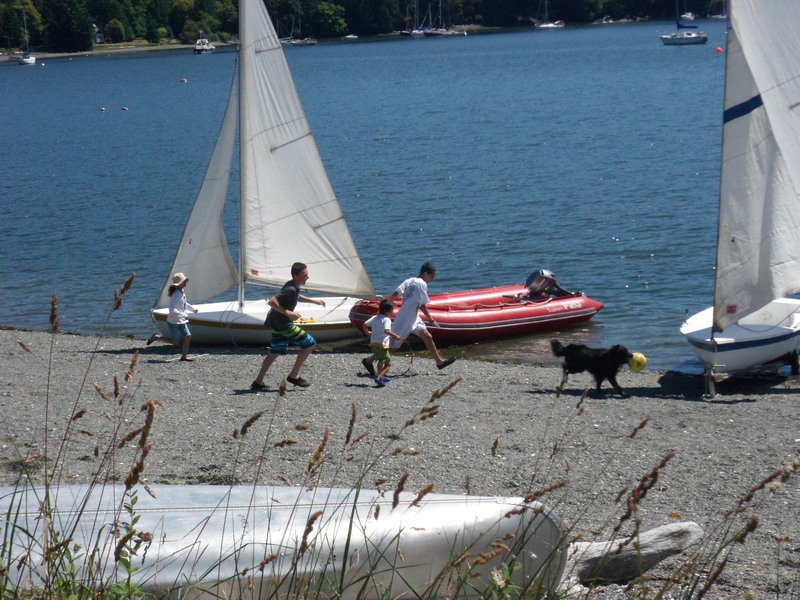 A true Pender summer day! Here are a few pictures of our first water day of the season. Our thanks to the Board, almost all of whom turned out for this starter day. 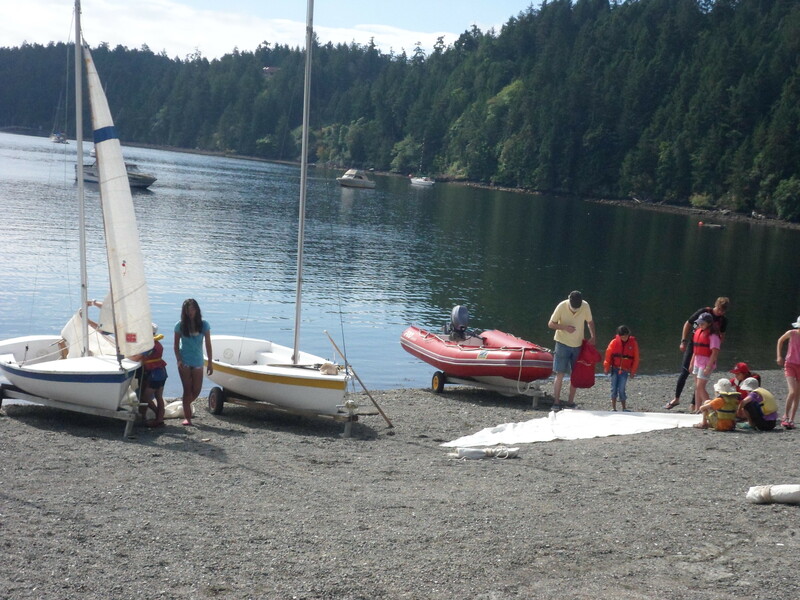 We had cleaned boats (cleaned a weekend ago) and a spruced up parking area to show for their collective efforts. Happy and safe sailing to everyone. This entry was posted in Uncategorized on July 7, 2014 by johnonpender.